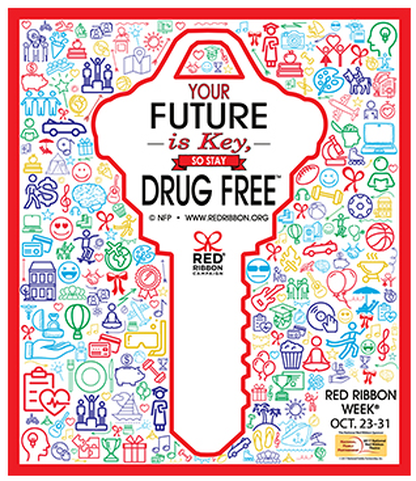 Red Ribbon Week in October is an opportunity to commit to and support the fight against illegal drug use. Red Ribbon Project and Eagle River Youth Coalition are committed to doing our part by teaching our students to refuse alcohol and other illegal substances, not just during Red Ribbon week but throughout the year. Just ribbons and pencils don’t change behavior, however. It takes a real partnership between schools, the community and families to increase the probability our students will make wise choices regarding the use of alcohol and other drugs. We hope the ribbons and pencils serve to remind students to make safe choices, and remind adults of their role in prevention. Eagle County and other rural resort region counties are often marketed in ways celebrating alcohol and marijuana consumption. There are numerous events sponsored by large alcohol companies with very high visibility. Teen binge drinking in this region continues to occur at a higher rate than in the rest of the state and nation, according to the Healthy Kids Colorado Survey (a biennial survey measuring risk behaviors among youth). I have recently noticed public-service announcements saying “Parents: The Anti-Drug,” or “Parents: You Make the Difference.” Parents: you do make the difference. School interventions alone will not change behaviors outside of school. Modeling safe and healthy choices? Providing opportunities for your children to see you having fun without the use of alcohol? Communicating clear, consistent messages regarding no drug use and no underage use of alcohol? Supervising, supervising, and supervising? You supervised your children when they were toddlers and during the early elementary years. Supervision in the later elementary years, middle school years, and on into the high school years is critical. The average age of first experimentation with substances is 11 years old and is usually done in a child’s home after school hours, or in other hangouts where they get dropped off. If a child is vigilantly supervised, early experimentation is less likely. Stop in at parties also and check with the hosting parent to confirm that they will be providing supervision. Let’s join together as prevention partners. Talk to your children this month. Re-emphasize your rules and expectations. Plan alcohol-free family activities. Wear a red ribbon during October. Together we can make a difference. previousDomestic Violence Awareness Month: What is Domestic Violence?